An antique gold bracelet of interconnected bar and oval links, the clasp inscribed "Amitié", in 18k. Austro-Hungarian. 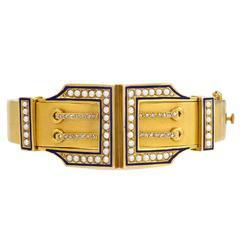 An antique gold bangle bracelet with a double-buckle motif comprised of half-pearls and diamonds with blue enamel detailing, in 14k. Inner circumference: 6.5&quot;. 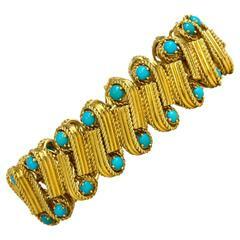 A reeded gold bracelet of interlocking segments with scrolled turquoise terminals in 18k. Cartier #3544.